LL Cool J-inspired headlines aside, Friday was an amazing evening by anyone's account. And why not? The young Penguins had excavated quite the hole, a 3-0 deficit just 3:37 into the second period. To think that a comeback was in the cards would have been considered by some as cockeyed optimism. But this is a team that went without Sidney Crosby and Marc-Andre Fleury in bulk quantities this season. Did you think they'd fold the tent after falling down by a few goals? Not only did they not fold the tent, they actually took the lead, scoring goals two at a time on two separate occasions and pulling ahead with 15 minutes to go in the third. But Scott Gomez scored on a setup from former Pens Jaromir Jagr and Michal Rozsival with 10 minutes remaining, opening the window for some of that potential doubt to creep in. But again, there would be none of that, as what some called a "controversial" penalty resulted in a memorable Crosby/Malkin goal at 18:19. A late Rangers flurry resulted in a shot hitting the post in the waning seconds, but the Penguins held on for the 5-4 win, moving to 5-0 in this season's playoffs. --A comprehensive recap of everything from Jeff Jimerson pictures to game commentary to recaps of the scene outside the arena at the PG's Empty Netters. --The series resumes at 2:08 p.m. tomorrow (Sunday). --A reader reports two celebrity sightings at Saddle Ridge, postgame: "THE" Donnie Iris and former A&L Motors pitchman Colby Armstrong. 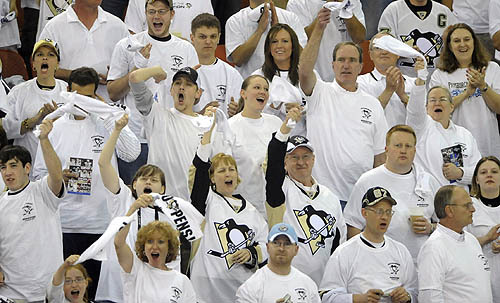 --Gene Collier wonders why the Penguins wanted a whiteout. --SURPRISE! Rangers coach Tom Renney is not too happy with the referees. --SURPRISE! A New York Daily News column entitled, "Sidney Crosby Diving for Penalty". --Ron Cook says tough guys are worth their weight. --This is the first time the Penguins have overcome a three-goal deficit in the playoffs since Game 1 of the 1992 Stanley Cup finals against Chicago. 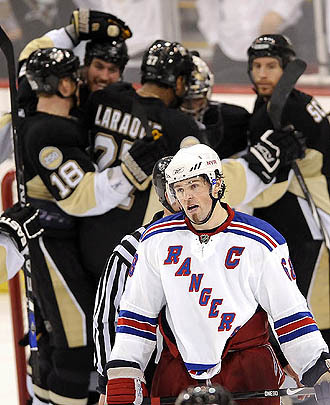 --The Rangers drop to 93-2 all-time in playoff games during which they held a three-goal lead. Their other loss came on April 6, 1967 against the Canadiens. They led 4-1 before falling 6-4. Friday's game was the most intense I've ever been to at the Arena. It was just total pandemonium. As for the whiteout, why criticize it , Mr. Collier?Is that the best you can do to make a story/headline? Cut me a break. Pathetic. To that end though, the NHL should go back to home teams wearing white. However, a whiteout isn't as off-base as he tries to suggest. Penguins live in snowy regions which I'm sure have whiteout-type blizzards. I thought it was awesome. The arena actually seemed brighter with all the reflective white shirts (they were just plain white shirts, they didn't have "reflectors" but you know what I mean, right?). It's a neat crowd participation gag and it was cool to see 99% of the people participating. When even the stuffy middle-aged business crowd puts the T on over their oxford shirt, that's great to see. And boo to the lady near us complaining about the noise, particularly our cowbells. If it's too loud, STAY HOME or BUY EAR PLUGS. Awesome that she talked to the usher and he told her he wasn't going to do anything about it. The white-out is kind of amateurish (unless this is 1993 in Winnipeg), but it looked great on TV. Like Drury's goal wasn't a high stick. His blade was even with his friggin' chin. Either he's a midget, or that's a high stick. Stop it. Jagr, Straka, and the post-game hosts all cried on the Rangers Post-Game Show after the game last night. It was fun to see them squirm. On a related note, the Stiller cleaned up today. Love the Mendenhall/Sweed combo!! !